Prefinished metal siding on south and east elevations. In cold climates, the standard aims to “reduce peak heating loads to facilitate the provision of high comfort levels with simple and reliable mechanical systems” (For more, see “Passive House: Information for Property Developers, Contractors, and Clients,” published by the Passive House Institute [PHI] in 2014.). The thermal performance requirements of the standard allow a building to maintain a comfortable indoor temperature year-round while using less than 15 kWh annually to heat or cool 1 m2 (10 sf) of useable space, limiting primary energy use for the structure’s full operation. This reduction of primary energy use facilitates the transition to net zero by decreasing the amount of energy produced onsite. Further, due to the ‘passive’ nature of the Passive House standard, components are adapted to local conditions, so buildings can maintain interior temperatures for days without power. When it comes to resilience and durability, Passive House-certified buildings provide a responsible use of capital dollars. Saving on operational costs across the total life expectancy of a building, the standard allows taxes to be directed to more relevant priorities, such as social programs. In 2015, the process of evaluating the construction of Valleyview’s new town hall began. After completing a preliminary design, the town opened the bidding process for a design-build contract for a Passive House building at a competitive price, which controlled the possible cost overruns innovative technologies often require. In 2017, the design-build contract was awarded to Scott Builders and the team of designers and consultants it hired (mentioned earlier in this article). The combination of orientation, fenestration, and building envelope systems is key to effectively maintaining comfortable indoor temperatures year-round. Adhering to the standard’s requirements, Flechas Architecture designed the Valleyview Town Hall by following key principles of flexibility, functionality, accessibility, comfort, and sustainability. These values allowed the team to overcome various challenges faced during the design services, permit, and construction phases of the project. In northern climates, site placement and design optimization are extremely important, and even more so when it comes to the Passive House standard, as controlled solar gains help compensate for the regular energy losses of the envelope. Due to the extreme cold temperatures experienced in Valleyview in the winter, having a large site with a long side facing south allowed the team to capitalize on sunlight exposure and the necessary heat gains. Here, the configuration of the 2773-m2 (29,848-sf) site was perfect to accommodate the owner’s statement of requirements as provided by the town and fulfill the requirements of the standard. Meeting the Passive House standard in such a cold climate and on a site with little sun exposure would have been difficult, if not impossible, otherwise. The relationship between the building form and window configuration plays a seminal role in achieving Passive House certification. On this project, meeting the standard’s requirement for space heating of 15 kWh/m2 per year necessitated additional attention to the energy performance of the building envelope. For this reason, careful design considerations were made regarding sun exposure and fenestration needs. With the main entrance located on the west side of the lot, the rectangular massing extends eastward and exposes the long side of the building to the south, where all high-traffic working areas are located, maximizing the benefits of natural light in the workplace and providing views of the green area south of the building. The building’s orientation and simple layout are designed to achieve the optimal levels of sun exposure required to heat the building in the winter, helping maintain comfort indoors even when it is freezing outside. Sun exposure also posed a challenge in the longest and warmest days of the summer, as the project team then needed to reduce heat gains and ensure steady and comfortable indoor temperatures without compromising spatial flexibility. To ensure both energy efficiency and controlled natural light, as well as manage heat loss, Passive House-certified windows with a G-value of 0.57 were specified. This means the windows corresponded to a gain of 57 per cent of the inwardly radiating energy. The size and spacing of the windows was carefully considered to accommodate future changes to the functional layout throughout the extended lifespan of the building. Ultimately, fixed exterior solar shades measuring 914 mm (36 in.) were specified above all south-facing windows to control sunlight and potential heat gains in the summer months. Due to local unavailability of commercial Passive House-certified door systems compatible with common commercial hardware, it was necessary to specify light commercial doors. Regular commercial doors are compatible with many types of hardware, including automated closers, card readers, and panic bars. Most of these doors, however, perform badly when it comes to energy efficiency and air infiltration due to poor details at unit construction, latching, and accessible thresholds. This substitution was only possible due to the small occupancy of the structure (a Part 9 rather than Part 3 building under the Alberta Building Code [ABC]). Despite the advantages provided by the site’s orientation and fenestration considerations, the extreme winter climate conditions remained a serious challenge, as maintaining a steady indoor temperature of 20 C (68 F) while it is –40 C (–40 F) outside demands more energy than permitted under the Passive House standard. In cold areas, insulation of the whole building envelope, high levels of airtightness, and efficient frost-protection strategies are crucial to keep the interior warm in the winter without an active heating element like a boiler or furnace. 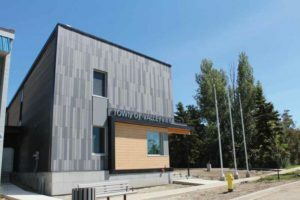 The main exterior finish of Alberta’s Valleyview Town Hall is phenolic panel siding on the visible south and east elevations and prefinished metal siding on the north elevation. The south elevation is shown here. Adhering to the Passive House standard allowed this building to compensate heat gains and losses throughout the envelope by using solar energy (42 per cent), internal temperature gains (34 per cent), and heating (23 per cent). The high levels of energy efficiency allowed for the installation of 28 kW of solar panels to fulfill the structure’s total energy needs. To ensure airtightness, the building envelope was designed to complement the super-insulated, thermal bridge-free timber structure with a rainscreen system in order to help prevent condensation and future issues related to moisture and frost. The structure is composed of full-perimeter insulation with a U-value of 0.097 on exterior walls 38 x 235 mm (2 x 10 in.) wide and a 38 x 140-mm (2 x 6-in.) insulated cavity space wall with an R-value of R-58, 3.4 times higher than the R-17 required by ABC. This design combines the positive features of orientation, fenestration, building envelope systems, and airtightness to effectively maintain comfortable indoor temperatures year-round. However, several design and material trade-offs were made to acquiesce with the requirements of ABC and the Passive House standard. To maintain steady temperatures across the three levels of the building, ventilation specifications included a mix of outdoor variable refrigerant flow (VRF) systems for cooling and heating and a high-efficiency energy recovery ventilator (ERV) with heat recovery. 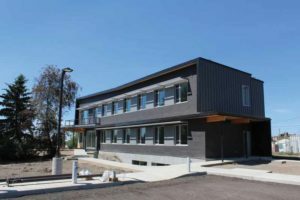 However, due to the climate conditions of Valleyview, the design team specified an ERV not certified by the Passive House Institute (PHI), resulting in a penalty on the performance values accepted by the institute for building certification. To improve the esthetics and the contextual integration of the town hall, the main entrance is framed by a human-scaled canopy with a raised roofline, superimposed by a glass fibre-reinforced concrete (GFRC) wall on the second storey. This design results in an attractive, yet subtle presence at street level welcoming visitors to the facility. The main exterior finish of the building is phenolic panel siding on the visible south and east elevations and prefinished metal siding on the north elevation. Although the initial project budget did not consider government funding, designing to the Passive House standard provided access to provincial green building grants. For instance, energy-efficient buildings in Alberta are eligible for incentives helping bring down the initial investment for solar technology. A grant from Alberta’s Municipal Climate Change Action Centre (MCCAC) allowed for the installation of 25 kW of solar panels on the new building’s rooftop. With $18,000 of extra funding, the building is equipped to generate 26,945 kWh per year, maximizing operational savings and reducing GHG emissions by 17 tonnes (19 tons) per year. 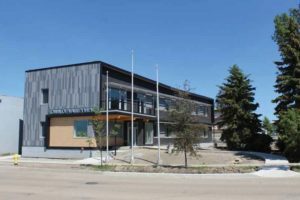 Meeting the core principles of the Passive House standard, this state-of-the-art building ensures long-term financial and environmental sustainability for the Town of Valleyview. 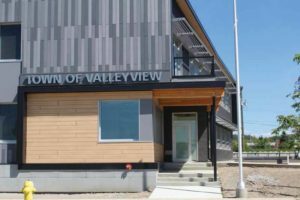 Moreover, the Valleyview Town Hall sets a precedent for the feasibility of Passive House-certified buildings in northern climates as a means to reduce carbon dioxide (CO2) emissions and fight climate change. 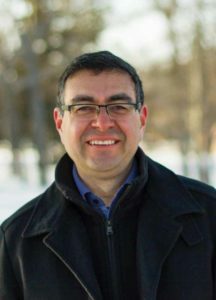 Oscar Flechas, AAA, AIBC, CPHD, MRAIC, is an architect with experience in various sectors and on different-scale projects. His firm, Flechas Architecture, is a progressive, small, and young studio that uses simple and creative design solutions to produce innovative and environmentally and socially responsible results. He is an early adopter of the Passive House standard and is passionate about creating low-energy and low-carbon buildings for future generations. One of the few architects certified as Passive House designer in Alberta, Flechas embraces most tools that encourage better building standards to help achieve greener buildings in Canada. Flechas can be reached via e-mail at oscar@flechas.ca.